The NFL is currently mourning the loss of one of their former players after a car accident resulted in a homicide. Retired NOLA Saint’s defensive end, Will Smith, was rear-ended while riding through New Orlean’s Lower Garden District on Saturday night. Smith and the driver of the vehicle exchanged words before the driver of the other vehicle pulled out a handgun and fatally shot Smith and wounded his wife. Smith was found slumped over his steering wheel, while his wife laid on the pavement with two gun shot wounds to the leg. Smith was drafted by the Saints in 2004, and helped the team win a Super Bowl title in 2009. 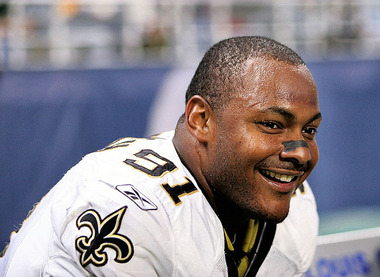 Smith retired in 2012, and was voted into the Saints’ Hall of Fame last month. The shooter has been identified as 28 year old Cardell Hayes. Cardell’s history with New Orlean’s Police Department suggests that Smith’s murder may not have been a random act of violence. Hayes’ father was killed by NOPD in 2005, and a settlement was reached. Apparently Smith was seen dining with one of the officers that was sued during Hayes’ settlement. Hayes shot Smith near the same intersection where his father was shot by the police. Coincidence?? Hmmm…What do you think?? ?